Summer is right around the corner, and I’m embracing it with open arms. With the weather warming up, I wanted to celebrate in the best way I know how – a fun summer manicure! Combining bright colors typical of summer with black-and-white that’s so on-trend this season, I created this fun chevron-accented manicure! Want to learn how to get this look yourself? 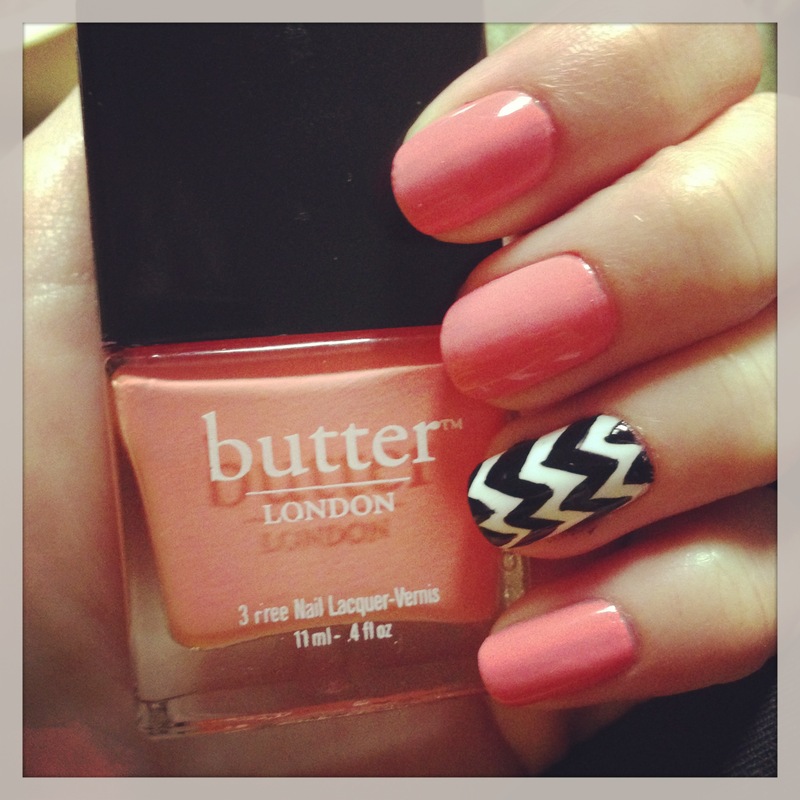 Read on for a few different ways to recreate this fun chevron mani! Now, I started my manicure, as usual, with clean nails and a coat of Nail Tek II. I sat down knowing it was manicure time, and I was prepared to spend the rest of the afternoon doing my nails – but it doesn’t actually have to take forever to get this look. Start with two coats of your favorite bright, summer color on every nail except your accent nail. I used Butter London’s Trout Pout, a bright, nearly-neon cantaloupe color. You can even add your favorite top coat – I used Seche Vite – to these nails at this point because you’re all done with them. To create the accent nail, add two coats of a stark white polish. I used Zoya’s Snow White. It’s a clean, opaque white with no shimmer or glitter – perfect for this look. At this point, there are several different ways for you to get the chevron accent. Use tape! We used tape to create a chevron pattern in a previous Manicure Monday. Cut out a chevron zig-zag piece of painter’s tape. Place the tape onto your nail securely. Paint over your entire nail with black polish. Wait a few minutes for it to dry. Remove tape. Wait longer for it to totally dry so you don’t smudge the lines with your clear coat. Finish with a top coat, and you’re done! Create your own nail stickers! If you don’t want to deal with tape or don’t have any, take a plastic bag. Paint your design directly onto the plastic bag and wait for it to dry totally. Once dried, peel the design off the bag and stick to your nails. You just made your own nail stickers! Finish with a top coat and you’re done. Freehand! If you’ve got patience and a steady hand, you can do what I did: freehand it. I used Kiss Nail Art Paint in Black and carefully drew out and filled in my chevron stripes. It took a long time, and they didn’t come out perfectly, but I’m pleased with the result. If you like today’s Manicure Monday, let us know! Which method will you try to recreate the look? ← The Glitz…The Glamour…The Great Gatsby!